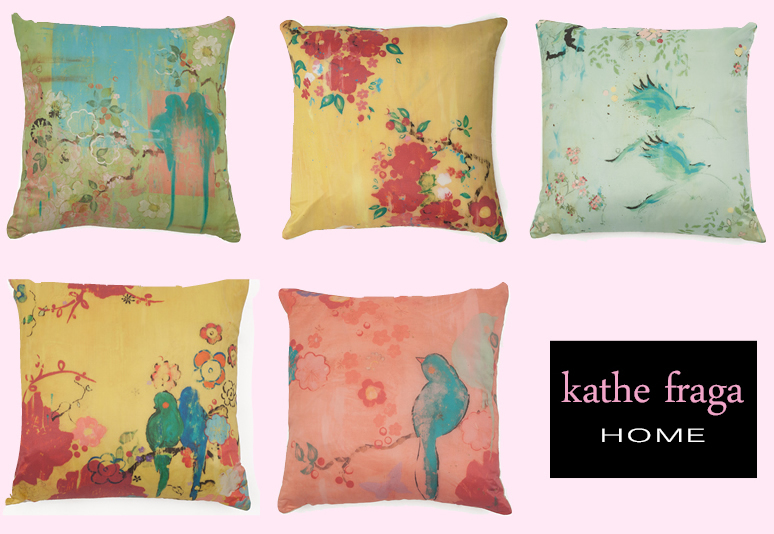 Pink, yellow, soft green and blue: I’m so excited to launch the new Kathe Fraga pillow collection, based on my paintings. My inspiration? 17th and 18th century chinoiserie with all the color and whimsical imagery that never fails to fascinate. Add to that the faded soft hues of vintage Paris. The frescoes and murals and aged wall paintings in the wonderful grand old French maisons and chateaux influence my work. I’m drawn to colors and patterns that reveal a story of old and of generations past. I love to paint birds and flowers to tell a narrative of life and family, sweet gardens, roses, love and joy. I hope you enjoy the new pillows, in silk or linen. They are lined and each plumped with a feather/down insert and invisible zipper. P.S. The pillow collection is now available through Flowering Around, Bainbridge Island; Museo Gallery, Langley, Washington; and Jane McIntyre Design, Winchester, England. Pillows are also available through my website. Also, please visit the Live Happy Inspired blog. This San Francisco-based blog recently had a fun post pairing my pillows with furnishings/interior design. Finally, a big thank you to Leslie Wood of Chancellor Interiors for including my painting on her Hadley Court design blog in a post commenting on the current trends at High Point Market–a lot of pink and a lot of chinoiserie! The high-pitched screech of the eagle cuts through the drip of the raindrops. They’re looking to nest and fighting off a seagull coming too close. The robins are everywhere, so busy, busy, busy. And the hummingbirds, so tiny but so loud as they swoop and forage. Everyone’s building nests. The daffys, a little wet and bedraggled have pushed through the damp soil in the little garden behind our old stone house, sunny and yellow. The age old camellias are a-blooming, red and pink and another pink right on cue. On the porch, the purpley blue hyacinths in their purpley blue hand hewn wooden planters waft their perfume into the front hall every time we open the door. “After The Rain, A Spring Serenade,” my new painting on frescoed panel, inspired by the rain and the garden and bird friends! I’m delighted to be part of Museo Gallery’s beautiful Garden Show-my 5th year. It opens April 5. Please join me in celebrating Spring and all the wonderful artists at this joyous show! 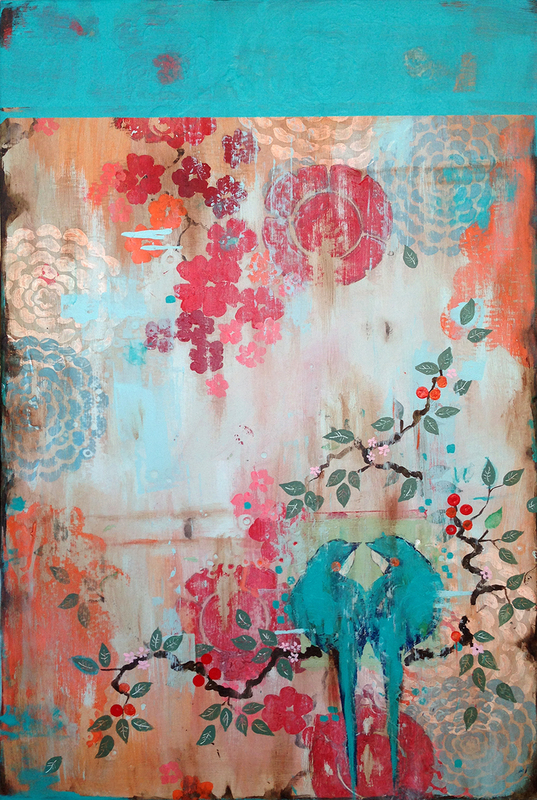 Trophy Wife, Episode 3 and Kathe Fraga Paintings! 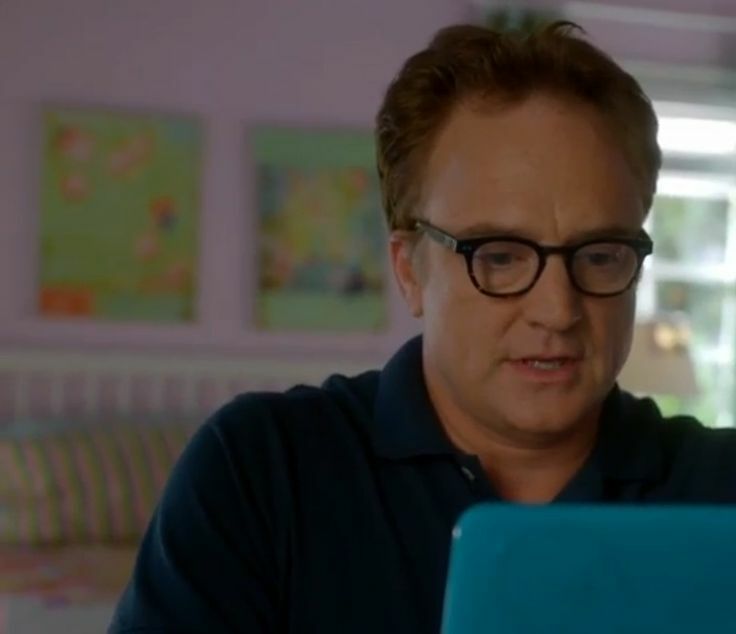 My paintings “Garden Dance” and “Cherry Blossoms” on Trophy Wife, episode 3 – with Bradley Whitford! I was very honored and appreciative to see two of my paintings featured on ABC’s “Trophy Wife” with one of my favorite actors, Bradley Whitford! The two pieces, “Garden Dance” and “Cherry Blossoms”, reflect my love of soft green with pink and orange. This is the third time my work has been featured on a TV series and I give a huge thanks to my art publisher, Grand Image, located in Seattle. Merci mille fois! It is so much fun to see my work included in these shows! 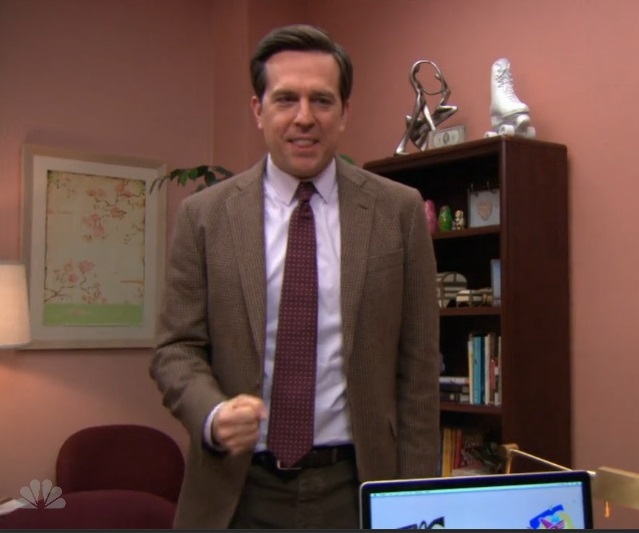 The two other shows that added my artwork to the set are “Is That You, Chelsea” with my turquoise painting “Chez Nous” and “The Office” — in Roseanne’s Barr’s “office” along with another favorite actor, Ed Helms! These “twin” paintings are cream with soft pink, titled “Remembering I” and “Remembering II”. Three of my new pillow designs. Happy News! 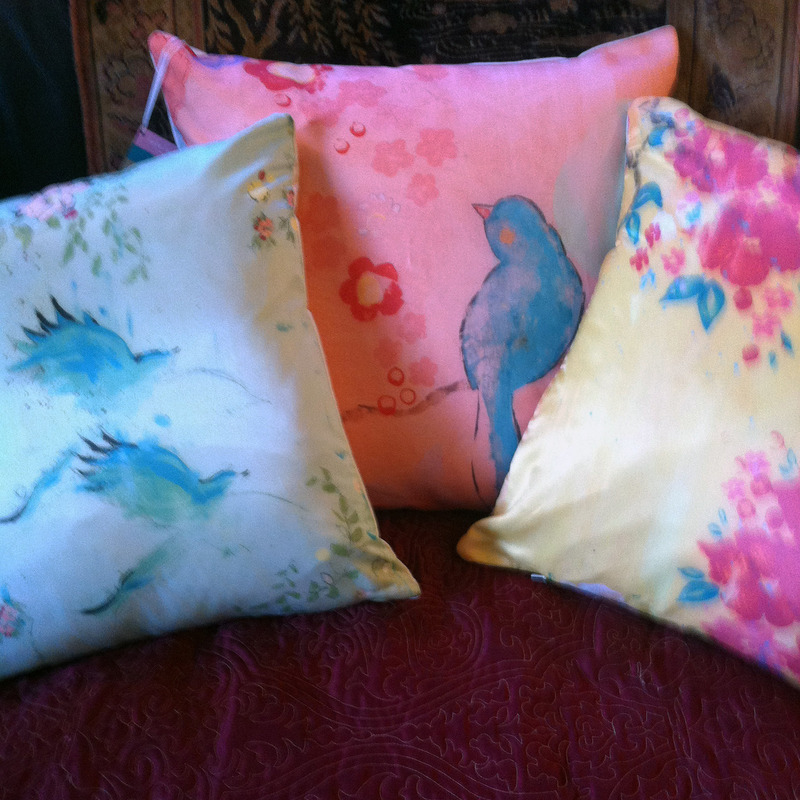 The new “Kathe Fraga Home” pillow collection makes it debut this December at Museo Gallery, Langley, Washington! Here’s a quick picture I took yesterday, (because I couldn’t wait to share it with you), but we’ll be headed to the photo studio for more professional shots of every design. The pillows are available in either luxurious silk or lovely linen with plump down/feather inserts and best of all, they’re all made in the USA. 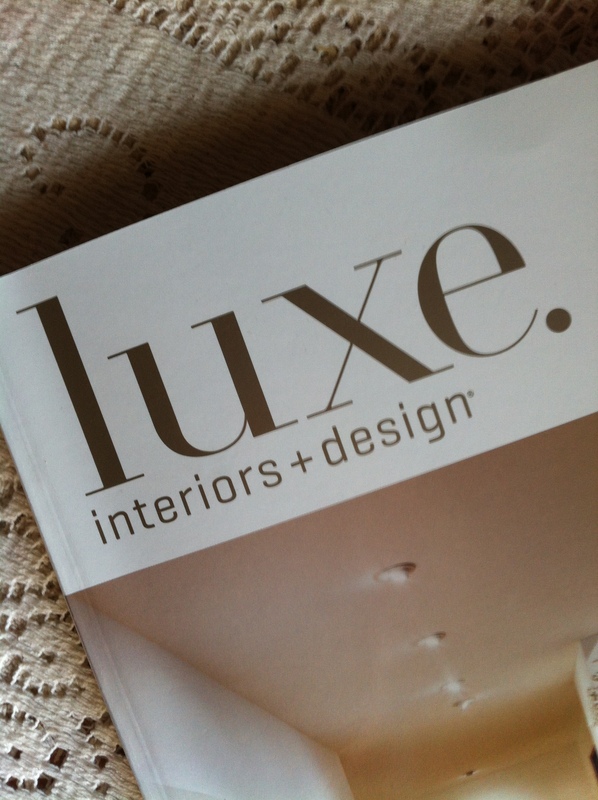 “Battle of the Chefs” with Luxe Magazine! I was happy to donate a painting to Luxe Magazine’s recent “Battle of the Chefs” event to benefit a college scholarship fund for deserving young women. What a good cause! And the “Battle” was fun too–groups of architects, designers and others competing in teams to cook up dishes with “secret” ingredients just like “Iron Chef” on TV. Thank you Luxe Magazine publisher Debby Steiner for placing the winning bid on my painting–it couldn’t have gone to a better home! I’m thrilled to be a part of the upcoming DIFFA GLAM: Tablescapes! It’s my third year of being involved with this very worthwhile event. And it’s fun! Fabulously decorated tables, auctions for fine wines and dining at some of the Seattle area’s best restaurants, and new this year — custom decorated wine buckets. I’ve created one of these unique buckets, along with Valley & Co, Heather Christo, Watson Kennedy, Amanda Pearl, The Gracious Girl and Masins Fine Furnishing. I’ve painted my wine bucket to reflect my “French Wallpaper” series of paintings based on aged murals and papers from the 17th and 18th century grand manors and castles of France. My work is also influenced by my love of vintage chinoisserie—so lots of pinks, oranges and blues. If you’d like to know more about my work, please visit my website. I’m also very happy to announce that I’ll be giving away two pairs of VIP tickets to attend DIFFA Glam valued at $150 per pair. Please leave a name and comment on this post by October 4 and I’ll pick the lucky winners’ names from a hat! The DIFFA GLAM: Tablescapes event will take place at the beautiful Masins Fine Furnishings & Interior Design in Bellevue on Thursday, October 10 at 6:00 pm. You can find out more about the event here. If you haven’t heard about DIFFA and the important work the organization is doing, here’s a little background information: DIFFA: Design Industries Foundation Fighting AIDS is one of the country’s largest supporters of direct care for people living with HIV/AIDS and preventive education for those at risk. Hope to see you there! Happy bidding! I had the opportunity (and fun!) of painting a variety of platters/dishware for the upcoming “Art of the Table” auction (see previous post) to benefit the Bainbridge Island Museum of Art. More than 20 artists were invited to contribute hand-painted pieces and the results were wonderful to see. Thank you to Margaret Stine and BIMA for hosting a lovely reception at the museum last night for the grand unveiling and display of the finished work, all fired and glazed. Here are a few shots of my work. What a joy! Recently I was asked by the wonderful Margaret Stine, business partner and wife of artist and author Richard Stine, to participate in a terrific cause: a benefit for the newly opened Bainbridge Island Museum of Art. The event: “Art of the Table II,” a special waterfront dinner party and auction for 100 (by invitation only), coming up in September at a private home on Bainbridge Island. The artist’s challenge? Painting on porcelain/pottery blanks–platters, bowls, plates etc. at Bainbridge Island’s Heart and Soul. Little tables that dot the sunlit space and small bottles of paints and scraping tools and brushes with fine tips line each spot, ready to go. Painting on ceramics is new to me. The colors in the wee bottles are a mere shadow of what they’ll be when fired in the kiln. So Peek-A-Boo pastel pink, so lovely and soft at first glance, might turn into something more vibrant and much more pink! It’s been really fun to be part of the group of artists painting on ceramics to benefit our lovely Island Museum: Richard Stine, Max Grover, Karen Sprague, Michael Pontieri and more. It’s our anniversary! So we recently took a special little road trip to one of our favorite spots in Washington: Langley by the Sea, a sweet little town on the water where I show my work at Museo Gallery. (New work, opening August 3!). On our way, we stopped for a bit to explore the historic, and also seaside, town of Port Townsend, filled with grand old Victorian homes and intriguing brick inns, along with shops and restaurants lining the main street. This trip, we ventured off the usual downtown destinations (William James Bookstore!) and discovered some new hidden gems. I am absolutely in love with the wonderful restaurant Sweet Laurette. Major swoon. Nested along a vintage-y Port Townsend quiet street, we sat outside in the little courtyard, surrounded by all sorts of blooms and birds too, bathing in a nearby bath. Absolutely charming! Lunch was beyond amazing: moules frites (mussels and fries)–I’ve never tasted better. Down the hill, we luckily (!) found a tiny, magical shop filled floor to ceiling with old fabulous books in every nook and cranny. “Insatiables: old, rare & curious books, always buying.” It was hard to know where to look first. We could’ve spent hours here–days even. But here’s what called out to me–two small books with cream and soft blue covers with pattern-so beautiful in a shy soft way. And inside, colorful romantic illustrations along with an inscription in a very old fashioned cursive style. (Copyright 1893, Poems by Whittier, Vol I and II). We then headed to one of the most serene and pretty places–The Inn at Langley, surrounded by beautiful gardens, the sea, Georgia Gerber bronze sculptures (2 penguins hugging!) and a wood boardwalk with chairs and tables to just sit and do nothing but gaze out at the blue sea. I was thrilled to see my painting Springtime in the Afternoon in the Inn’s lobby! “Springtime in the Afternoon” in the Inn’s lobby. Now, I’m back in the studio, inspired! The studio has been a whirlwind lately! I’ve ignored summer’s tempting call to run outside and garden and beachcomb and bicycle because, quite honestly, the colors and canvases in the studio have been the main focus. Pinks and blues, reds and cream–irresistible to me. I am so happy to be holding brush in hand and working as I have for these past months for my show opening August 3 at Museo Gallery on Whidbey Island. Whidbey Island, for those who don’t know about it, is northwest of Seattle, two ferries away from the island where I live. I’ve loved Whidbey Island all my life, it always feels like home. My grandparents lived in this beautiful spot and one of the most vivid and happiest memories of childhood are the little snippets in my mind from visiting them: the long drive on the shaded graveled path under the towering firs and cedars (my brother and I would always struggle to be the first one out of the car–“I win!”), the sweet scent of blackberries, blueberries and raspberries basking in the sun, the huge rose garden my grandfather loved so much (he was actually a “tester” gardener for Jackson and Perkins’ new roses! ), the garter snakes I used to catch (and release) in the woods, and of course, Churchill’s old candy store where we’d go for Pixie Sticks and plastic bottles filled with syrup, yum! So, it’s always such a wonderful homecoming to come back to Whidbey and show my work in Langley at Museo. This will be my third show at this beautiful gallery (thank you owner and gallerist Sandra Jarvis) and one of many group shows that I’ve had the honor to be included in since 2009. For this new collection of work, I’ve been very inspired by the dear memory of the old (and new) big perfumed roses my PawPaw nutured in such abundance in the sunny back fields behind their home. I’m also remembering my love of Paris with her embrace of the colors that I love the most (back to pink, blue, cream, red) and for the first time, I’ve added gold leaf to some of my paintings on plaster as a nod to the wondrous old French mansions, cathedrals and castles that are adorned floor to ceiling (and ceilings too!) with this bright ray of golden gleaming happy sunshine. Birds and butterflies wing their way through my canvases and (new!) 36 x 48″ wooden panels. In my new series of five 40×16 canvases, the influence of 17th and 18th century chinoiserie abounds–deep greens, purples and oranges. Think age-old Japanese block prints, little lacquer boxes, kimonos. (Decades ago, my father brought my mother a beautiful deep green silk embroidered kimono long jacket from his many trips abroad and it never ceases to inspire my work.) Ukiyo-e “the art of floating” –enjoying the beauty of the present moment/Hiroshige art inspires with pattern and color. I continue to be excited by the generous and very kind artists whose work I know and admire. We recently hopped a ferry from our island to Seattle to enjoy the gorgeous encaustic work by Seattle artist Joyce Gehl. Her botanical work and colors are breathtaking. I also love the geometric colors and vibrant patterns on plaster of Bainbridge Island artist Gregg Robinson. Will Pope’s whimsical and narrative paintings of animals and more on color-infused plaster are just fantastic. So even while I just adore Klimt, Chagall, Matisse, Bonnard, and the most amazing Paule Marrot (she loved pink! ), it’s always nice to see the new paths and directions of artists painting in the here and now. So, here’s a little sneak peek of the new collection I call “Narratives”: tales of color, love, relationships, of old, generations, history, PawPaw’s rose garden, Paris, chinoiserie.